Capt. John Kumiski is a veteran fly-fishing guide in the Indian River waters of east Florida. He also is an accomplished freelance writer and contributor to Southern Saltwater Fly Fishing Magazine. 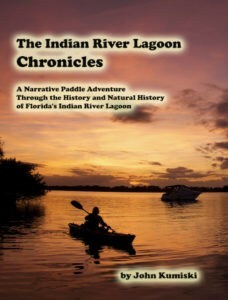 The Indian River Lagoon Chronicles - A Narrative Paddle Adventure Through the History and Natural History of the Indian River Lagoon, an exciting new book by John Kumiski, delves into the fascinating lore and natural history of the Indian River Lagoon. On December 1, 2013, five intrepid paddlers launched their vessels at JB's Fish Camp in New Smyrna Beach, Florida. Their destination was Jupiter, Florida, 160 miles distant. During the 19 day voyage of discovery, they travel the length of the Indian River Lagoon, meeting birds, snails, manatees, mangroves, dolphins, scientists, restaurateurs, seagrasses, other paddlers, the ghost of Henry Flagler, and much more. Into the tale of their journey is woven the forgotten history of the people who lived along the lagoon's banks - Indians, soldiers, settlers, agriculturalists, fishermen, treasure hunters, entrepreneurs, dredgers and many others. "The story of the Indian River Lagoon, one of Florida's most fantastic natural resources, needed to be told," the author explained. "What better way to tell it than by using a paddle adventure as a narrative thread to bind it all together?" The Indian River Lagoon Chronicles - A Narrative Paddle Adventure Through the History and Natural History of the Indian River Lagoon, by John Kumiski, (6 inches x 9 inches, 192 pages) is available from Argonaut Publishing Company, 284 Clearview Road, Chuluota, FL 32766, (407) 977-5207, spottedtail.com/indian-river-lagoon-chronicles. The price is $19.95, plus tax and $5.95 shipping.